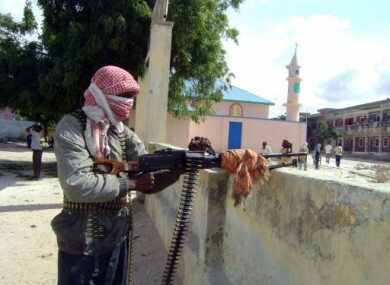 SOMALI GUNMEN have abducted two aid workers working in the north of the country. The Danish man and American woman were working in the Puntland region for the Danish Demining Group, which helps remove unexploded land mines. The Associated Press reports that the group could not be reached today for comment on the kidnapping. It is not clear who is responsible for today’s kidnapping in the Puntland province, which is generally considered more stable than other areas of the country. Kenyan authorities have blamed Somali militant group al-Shabab for several kidnappings in recent weeks in Kenya. Two Spanish aid workers with Medécins Sans Frontieres were kidnapped from a refugee camp in Kenya two weeks ago, prompting Kenyan security forces to cross the border in search of the militants. The Somali government recently banned aid workers from operating in areas controlled by al-Shabab over the high threat of kidnapping, despite the ongoing food crisis in parts of the country. Email “Somali gunmen kidnap US, Danish aid workers”. Feedback on “Somali gunmen kidnap US, Danish aid workers”.